When your field of research is judgment and decision making, it’s not every day you see a 45 minute interview on your topic. Or every week. Or every year. 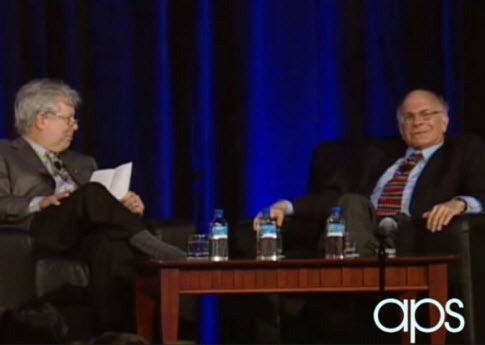 So when we were sent this interview featuring two JDM giants, Richard Thaler and Nobel Laureate Daniel Kahneman, we knew we had to run it, even if it is from 2008. Enjoy it: who knows when you’ll get to see another interview on judgment and decision-making (aka behavioral economics). Very cool! I’d heard Danny speak once and was unimpressed – he came across much better in this interview format. Thanks for sharing it. I always find Daniel’s interviews very insightful. You will not find a better mind on the psychology of judgment and decision making. Kahneman interview was written on January 17, 2014 and filed in Encyclopedia,Ideas,Profiles,Research News.